Hand Lettering and Calligraphy at Common Room Studio! Before we jump into the week, I wanted to share a couple of upcoming hand lettering and calligraphy workshops at my new studio space – Common Room Studio! 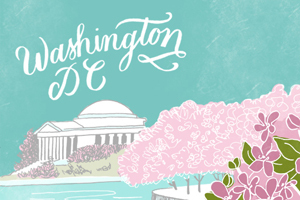 If you’re in the DC area, we’d absolutely love for you to join us. Come hand out with fellow lettering aficionados in the area, and learn a new skill while you’re at it. It’ll be so fun – come hang with us! First up, a hand lettering and watercolor workshop on Saturday, August 11 from 11 am – 1 pm! Join Samantha Testa of Painted Palettes for a workshop of lettering and good vibes! You’ll learn the basics of hand lettering using four unique pens and four different styles, along with how to create a beautiful watercolor background. And you’ll get to take home your very own 5×7 art print at the end of the workshop! Light sips and snacks will be served. Sign up right here! If you’re interested in learning the art of pointed pen calligraphy, join Michele of Meant to Be Calligraphy for her popular Introduction to Modern Pointed Pen Calligraphy workshop on August 12! Michelle will teach you how to use traditional materials (pointed pen calligraphy nibs, an oblique pen holder and real ink) to create gorgeous hand-lettering with a modern twist. You’ll learn how to create the nuanced thick and thin lines that set pointed pen lettering apart from regular handwriting. Plus, you’ll go home with all the materials you’ll need to continue practicing and showing off your new lettering skills. Sign up right here! If you’d like to learn about more upcoming workshops and events at Common Room Studio, sign up for our newsletter right here!